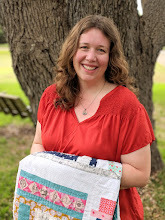 My new book, Sew Organized for the Busy Girl, is filled with projects that are fairly quick to sew, but I also included a chapter of projects that can be made over a longer period of time. The first project in that section is my Summer Tourist Quilt. I have to tell you... I loved making this quilt. You all know how much I enjoy seeing things in color order, and these blocks just make my heart sing. There are so many memories in here as I look at all the different prints and remember when I bought them and what I've sewn with them. It's such a simple quilt design, but sometimes I think the simplest things are my favorites. For our first wedding anniversary eight years ago, my husband took me to Laguna Beach, a beautiful little beach town about halfway between L.A. and San Diego. At the time, I was seven months pregnant with our oldest daughter, so putting on a swimsuit and heading for the sand was not really on my agenda. Instead, James and I spent many peaceful hours drifting through the dozens of shops and galleries that line the sidewalks there. Those memories came flooding back when I saw Pat Bravo's lovely new Etno collection for Art Gallery Fabrics. The collection was originally designed to showcase both ethnic and artistic elements, both of which are so present in Laguna's thriving art community, and the colors immediately reminded me of sand and surf. I had a wonderful time taking the prints that AGF sent me and turning them into a miniature version of a beach tote, just perfect for a day of window shopping at Laguna Beach. For the bag exterior, I paired leather yarn dyed Essex linen with the Looming Love in Pastel, a print which reminds me so much of a wash of watercolors on canvas. The bag is lined with Sauvage Sky in Arctic, and I added an inner pocket from Shore Remains in Trinkets. Cream colored strands of rope make sturdy handles and complement the bag's beach theme. Birch sent me a lovely stack of prints and coordinating solids to play with for this blog hop, all of which I thought would be perfect for making a giant colorful floor pillow. If you've never made one of these, you should definitely give it a try. Floor pillows are an inexpensive substitute for bean bag chairs, and they fit in just about anywhere: the library corner, the family room, even the patio. Sewing up a pillow cover for these is no harder than making a mini quilt and just as much fun. In this case, I sewed together 14 strips, each 2 1/2" x 28", to make the pillow top. The solid strips are all quilted in coordinating Aurifil thread, 1/8" from each long side. It was really fun to use all those different colors of thread on this project, and I love the way it turned out. I used my favorite Woodland Party print for the pillow backing. Everything about this fabric makes me happy, especially those little strings of rainbow bunting. Monday 2/2: Marte from Companie M.
Today kicks off our very first Sew the Library Link-up of the year. Rather than tackling one of the big projects I've been wanting to sew, I decided to start small with a cheerful little pincushion based on a pillow from Sherri McConnell's lovely book, Fresh Family Traditions. 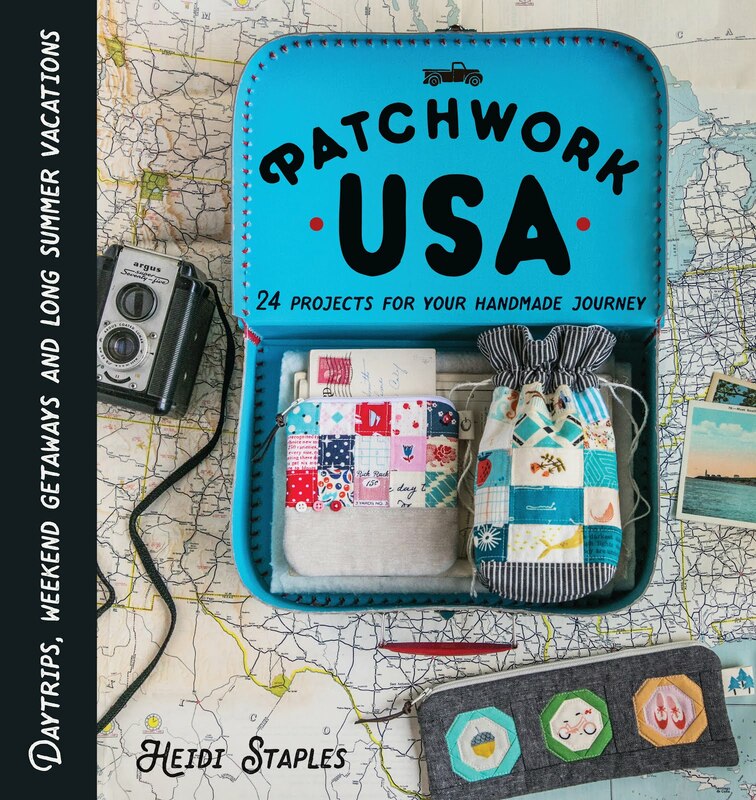 Sherri's book is packed full of traditional projects made a little more modern thanks to fabric choices and block settings. I absolutely adore the Kitchen Sink quilt on the cover which I'm hoping to tackle later this year when I have a bit more time. Her Spring Flowers Pillow is a wonderfully simple design made of half square triangles. I shrank the finished size of the squares down to 1 3/4" and made only nine blocks, giving me a pincushion just under 6" square. I paired one of my favorite color schemes (pink, orange, yellow, and purple) with plenty of black and white text prints. It all comes together to make the sort of project I adore: simple, colorful, and oh so useful. The back of the pincushion is a favorite piece from Lori Holt's Flower Patch collection. I adore this print and will definitely be ordering more. With spring on my radar already, I think this pincushion will look perfect next to my new terrarium. They're both already making my sewing room a happier place! So what did you sew from a book or magazine this month or last? (We're including December in this first round!) You can link up your Sew the Library projects below through January 31st by clicking on the Inlinkz button below and following the directions. Be sure to visit at least a few other posts and share the love by leaving encouraging comments along the way! This week I had the chance to play with some fabric designed by the wonderful people at Hawthorne Threads. They were kind enough to send me two pieces from their new Etched collection to make into something fun. I had originally planned to turn these into a little clutch, but they turned out to be exactly what I needed to corral all my planning supplies for one of the biggest projects I've ever tackled: our family's upcoming move to Texas this June. But first let's talk about the fabric. I would agree with some other reviewers that the Hawthorne Threads fabric is a little stiffer than your typical designer quilting cotton, but since I was using the prints to make a large pouch, that wasn't a problem for me. I paired Vanes in Tulip with Essex linen in Flax for the exterior, saving the charcoal Hexie Bramble print for the pouch lining. A grey zipper accented with a leather pull was the final touch. The finished pouch is 13 x 16" -- just the right size to hold my master planning binder, moving box inventory, and any other papers I don't want to lose along the way. Etched is the latest collection designed by Hawthorne Threads, coming out this month, and I think it's their best yet. The simplicity of the prints and the pairing of just a few well chosen colors (charcoal, glacier blue, indigo, and tulip) on white make them absolutely perfect for modern accessories and home decor projects. My girls are always on the lookout for the colorful patches that sometimes shine through our windows onto the floor, and I'll admit that I've teared up at the sight of more than one rainbow in the sky after a California rainstorm. They are so rare, so achingly beautiful. They remind me of promises kept and love that won't let me go. Just the sort of message that I wanted to share with a friend today through this little pillow. I am a control freak. I have to admit, I was pretty stunned by these results. Every single one of those words, with the possible exception of "relinquishment" has a negative connotation. Is being "out of control" truly that unpopular in our society today? Do we really see the inability to manage everything in our lives as a sign of weakness? The more I thought about this, the more the pillow in the picture above kept coming to mind. This scrappy pillow and I have had a bumpy relationship since I made it over a year and a half ago. On the one hand, I adore it -- those great scraps, all the colors, that dotty border. But at the same time, it drives me absolutely crazy. Nothing is in color order, some of my blocks don't match up perfectly, and a few prints are even upside down. How sad that my need for perfection sometimes robs me of the joy I could take in things like this which are still lovely, even with their little mistakes. So this year, I've decided that I'm going to be out of control. I'm going to do the best I can to hold up my end when it comes to my responsibilities and then I'm going to let the rest go. Because honestly, any control I think I have is nothing more than an illusion anyway. I've even placed that scrappy little pillow in the entryway of my home so that I'll see it every morning when I come down the stairs. I need that daily reminder to accept my own weaknesses and imperfections so that I can be even more gracious with those that exist in the people and situations around me. And I'm really hoping that as I grow in this area, I'll be able to spend less time managing my life this year, and more time enjoying it. Wishing you all an imperfectly wonderful 2015.